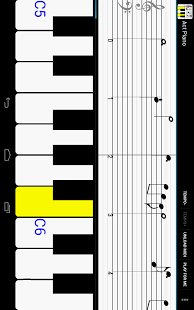 Besides a multitouch 88-key piano keyboard, Act Piano turns MIDI music into notes and score, you can learn to play songs by following the automatically scrolled sheet music and highlighted keyboard. It is a funny game and very helpful to learn piano and notation. 8. practice the Treble clef or the Bass clef. ActPiano features a 88-key scrollable multi-touch virtual keyboard. The piano keyboard is fully customizable. You can change the size of both white and black keys, which best fit your fingertips. Piano without good sound cannot be perfect. 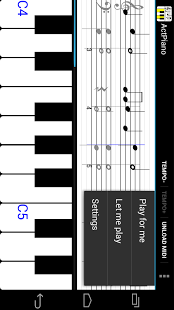 The app uses sampled piano voices to ensure a good sound quality. The most distinct difference between ActPiano and other piano apps is the stave / score view. In the free play mode, the view shows the notes of the keys you playing. Just launch the app and touch the keyboard, you will know the difference. The stave view is more powerful when you learn to play piano songs with ActPiano. Thanks to the stave/score view, you don’t have to bring sheet music with you to learn piano pieces. Click the ‘Load MIDI’ button, select a song, and its sheet music will be visible in the stave view. Then you can watch demonstration play in “Play it for me” mode, or practice your skill in “Let me play” mode. Actpiano comes with more than ten easy piano pieces( Happy Birthday, All the Pretty Little Horses, Largo from the New World Symphony, Fur Elise, Christmas songs and more). Those could be your initial piano lessons. As ActPiano can load midi (*.mid file) from SDCard, you can practice any song your like. Turn your MIDI music to score and learn to play it on your Android devices! You can find MIDI files of any song you like on the internet. Download and Play it with ActPiano! The app can generate a sheet music from MIDI file. You can play the music by just following the automatically scrolling keyboard and score. This App can be a musical learning game! Note: There is a problem with most piano midi files on the internet, that is the treble clef and bass clef are on one track (MIDI format 0). While ActPiano takes the first track as treble clef and the second track as bass clef, it is impossible to play this kind music by hand. In this case, you can use PC software “Notation Musician” (free trail available ) to split the track and export as a new midi file. 1. Settings for turn on/off keyboard highlight and automatic scroll.